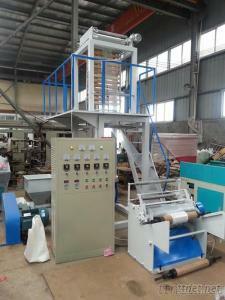 This machine is use to blow PE( LDPE, HDPE, LLDPE) for plastic bags, food packaging or agriculture use. 1>. Its extruder, cylinder and screw rods are made of quality alloy steel that have been nitrogen and processed in a precision way, hence it is sound in hardness, durable in corrosion resistance. 2>. The specially designed screw is of sound quality in plasticizing which helps increase the production capacity. 4>. It is widely applied to producing the packing bags for foodstuff, clothing rubbish, vest ones, and industrial packaging and etc. 5>. The machine body is channel steel frame with single rolling friction, which is suitable for blowing high-low pressure PE industrial film and agricultural mulch film.